If the main control becomes available again Backfade can be taken off line and will seamlessly cross fade back to the main console. Lighting cues are recorded via the DMX inputs and stored with manually entered fade times. Backfade can also track the show in progress displaying the current cue, allowing for a quick switch over in the event of a main console problem. 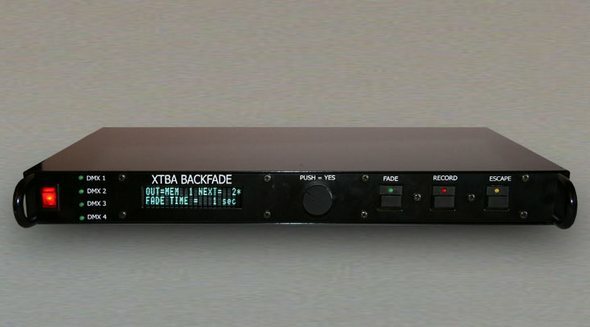 Backfade uses an encoder pot with a push switch and a simple three button interface to access all the features via the 20 character, 2 line VFD screen. The VFD (Vacuum Fluorescent Display) provides greater clarity and greater viewing distance than a conventional LCD. Backfade can store 99 memories with fade times up to 99 seconds. Backfade can also be supplied with a remote control that mimics the front panel and provides remote control via a five wire interface up to 1000m away from the main unit. Backfade can also be supplied with an input card that allows simple analogue push button panels to be made which interface to the main unit giving simple control to call memories from any or multiple locations.